Click on the image to see a selection of stairs that we have produced. 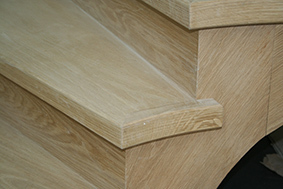 TD Joinery excels in producing bespoke staircases. Our strength in creating staircases lies in our skills, gained over many years of experience, combined with a spacious workshop. This allows us to pre-assemble and finish all treads, winders and risers prior to delivery. We can pre-assemble any size to complete perfection, ensuring a perfect fit and finish into the stairwell, regardless of its shape or size.